It’s time for another Prize Draw! 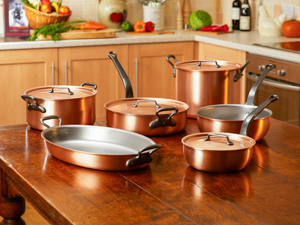 As promised, we are going to hold another Prize Draw this summer for customers who have posted product reviews for their Falk Copper Cookware on our website. The next draw will be held on August 5, 2013. To post a review, just log in to your Falk Culinair account, and select the “Manage your product reviews” option where you will find the items you previously purchased with a “Write your review” button displayed. The only condition is that you must actually own the item(s) you are commenting on. You can of course post a review for as many different items as you like; subject to this condition, and each will be counted separately for the draw. All reviews posted between the beginning of this year and August 3, 2013, will automatically be entered and the winner will receive their selection from our extensive range of cookware with a value of up to £500 with our compliments. The previous draws both had under a 100 entries, so the odds here are quite good, particularly if you post reviews for more than one item! Nice one - my entries are in!